Murky rock lightened up by a nifty violin element from the scouse troupe of Hot Club De Paris, mingles in with the muggy air to provide some even tempo background to the lively and excitable chatter. The guitars possess a jazzy element, steering the band into the intriguing category, that and a bit of quirkiness to boot. You can’t help but get the impression that the guys will sound the same on record as they do live, not necessarily a band thing (any JJ72 fans out there?). Standout offering is the curiously entitled ‘Sometimes It's Better Not to Stick Bits of Each Other in Each Other, For Each Other’, wrapping up quaintness, energy and a provocative nature into a neat package, to make you want to revisit Hot Club De Paris, if only just once more for curiosity’s sake. It is confession time; this is the second attempt at reviewing this Milburn set. After trying to be clever by undertaking music journalism’s attempt at trying to put a fruit pastel in my mouth without chewing it, by reviewing this Sheffield quartet without reference to the Arctic Monkeys, I decided to give in. 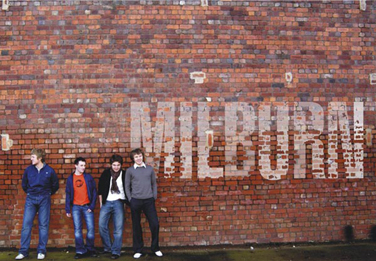 The lobbing vocal swagger, The Libertines based guitars and gritty life tackling lyrics means that Milburn will naturally be clumped in with the Arctic Monkeys and, with songs like the boisterous ‘Storm In A Teacup’ it is hard for anyone to argue why they shouldn’t be either. It is worth remembering that Milburn had honed this catchy and punchy sound at least at the same time as the Arctic Monkeys, anyway. Front man Joe Carnall strikes you as an authoritative and intelligent figure, who knows how to let loose and he certainly must take some credit for the rambunctious atmosphere and crowd surfing frenzy that is happening, despite the oppressive room temperature. The bop-happy previous single of ‘Cheshire Cat Smile', is in essence indie music set free, emphasized by the frivolous gyrating and smiling crowd. This implies that Milburn are more than capable of making an impression on the music world, without having to ride on the back of the success of other bands from their home city.